I knew this would happen. I knew when the time came for me to sit down to absorb and organize my thoughts after the amazing three days I just spent in the desert landscape of Tempe, AZ, (a city known in my personal history as the backdrop for life-changing events), where I attended the inaugural Outspoken Summit for Women in Triathlon, would have me smiling and on the verge of tears. Happy tears. 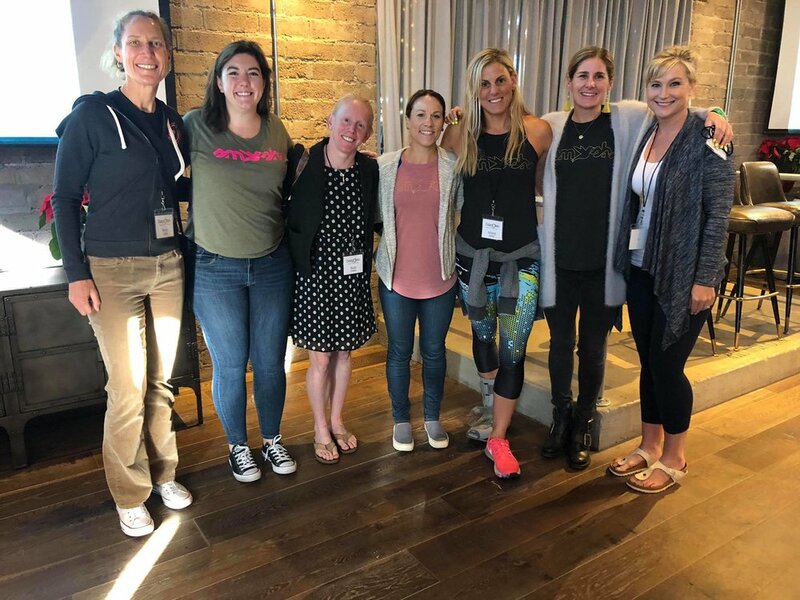 It is rare and wonderful to be a part of a groundbreaking event in history, but that is the best word to describe the energy created at the Outspoken Women In Triathlon Summit, groundbreaking. I knew it was an event I wanted to be a part of on its own, but also for the swell of change I had faith it would create. The Summit far surpassed any expectations I held before boarding my plane in Burbank on Friday afternoon. The entire weekend was inspiring, invigorating, fun, emotional, challenging, (I ran a hard run workout with a pro triathlete on Sunday morning, more on that later), but maybe the best word to describe the weekend for me personally, is reassuring. I have followed my gut pursuing this ridiculous energy, money, soul sucking and enriching sport for nearly a dozen years, a journey which has allowed me many chances to meet strong, smart, and competitive women on the race course, and NOW in swanky hotel lobbies. We all joined together to meld our minds and brainstorm methods on how to grow more opportunities for women in the sport of triathlon. The Outspoken Summit officially kicked off on Friday night with a raw and refreshing keynote speech from the multiple Ironman and Half-Ironman champion, America’s Greatest Triathlete of All-Time, and gem of a human being, Meredith Kessler. Meredith Kessler inspiring us all on Friday night. However, the weekend truly started rolling hours earlier when I ran into my TeamHPB and TeamSFQ teammate, the co-host and writer of LiveFeisty Media’s, If We Were Riding podcast and newsletter, the witty and whip smart professional triathlete, Kelly O’Mara, in the lobby on my way to check in. I have enjoyed bouncing ideas off of Kelly over the last year or so, equally for her triathlon and writerly knowledge, because she lends consistent in depth and honest feedback on both fronts. She is also hilarious. Those few minutes catching up with Kelly before the planned activities started, solidified the instinct I felt when I signed up for the Outspoken Summit months prior, this event was going to be special. The opening night reception was cold, but lovely. The gorgeous setting of the rooftop pool deck in the fire light was dazzling. The energy was open from the start. I met four kind ladies in the elevator before we even stepped onto the roof, but once Meredith started speaking, the gravity of why we were all together started to rest on our shoulders like the warm blanket we desperately needed; we were here to become strong leaders in triathlon and to raise each other up in the process. Saturday morning started early. I awoke hours before the sun. There were two group workout options, a group run with Meredith and another renowned pro, Rachel Joyce, or the swim I mentioned last week with my coach Hillary Biscay, and pro triathlete’s and Haley Chura and Tenille Hoogland. I know I whined last week about my jarred nerves every time I swim under Hillary’s gaze, what I left out was that every time I have swam in those situations, those nerves have faded by my first stroke and appreciation has taken over. I usually swim by myself, not only do I often have the lane to myself, but the entire pool. Therefore, the unique opportunity to swim with a lapping, laughing group of women and lane packed with swimmers like me, (at my level), under the care of Hillary, was special. Post swim session, left to right, Hill and Hillary Biscay, yours truly, and Haley Chura. Plus, Hillary gave me some helpful notes that I will work on every swim from now on out. Once we had all showered, we gathered in the lobby, and sat down to take it all in. It was a lot. The first speaker was the woman who changed triathlon forever, bringing it to the zeitgeist, the legendary Julie Moss. She started off sharing her epic story of the 1982 Ironman, the one where she crawled to the finish line in front of the ABC Wide World of Sports cameras. That experience alone was groundbreaking, but what she shared next, her races on the big island in both 2017 and 2018 were what truly kept me engaged; she failed in 2017, did not finish, but came roaring back in 2018 to not only qualify to race in Kona by finishing first in her age group at Ironman New Zealand, but to cross the finish line on Ali’i drive for the last time on her own terms. The legendary Ironwoman, Julie Moss. The first panel of the Summit held Julie and two other trailblazers in triathlon, Sally Edwards and Anne Hed. I want to be Sally Edwards when I grow up. Her vivacious and brilliant character was magnetic and lit up the room. She wrote the first book on triathlon training for women, is a serial entrepreneur, owning and operating Fleet Feet Sports for twenty-eight years, and was a stalwart in the early years of triathlon, initiating equal pay for men and women in the pro fields; a revolutionary effort that has remained true to this day. I missed my chance to meet Sally, Saturday was action-packed and she had left before Sunday, but her words made an impact, and I happy to say that I had already been living part of her message, (I have written a book, and continue to share my story), but I will continue to live her message from every day forward. Sally Edwards's self-published first book on Women in triathlon. Anne Hed is the essence of cool. She is an accomplished pro triathlete and an impressively successful business woman by co-founding Hed Wheels with her late husband, Steve. Anne’s tone during the panel was matter of fact, by making her story sound normal. It is not normal, it is sensational. As a young pro, she won a triathlon outright, beating the pro men field to win a brand new Subaru. She then sold that car in order to provide the seed money for her company, (a story that reminded me of another gritty entrepreneur in the triathlon apparel space, but I will circle back to that later). Sadly, Steve Hed died suddenly in 2014, but because of Anne’s fortitude and keen perspective, Hed Wheels is thriving today. Arizona Democrat Senator elect, Krysten Sinema. The final panel of the afternoon struck a chord of controversy. It was made up of Sika Henry, an athlete aiming to be the first black female pro triathlete, pro triathlete and innovator Rachel Joyce, and one of the most powerful people working at Ironman, the company, Diana Bertsch. I had reached out to Sika months prior when she wrote an article for LiveFeisty, so I was really looking forward to hear her talk. I strongly believe in her mission to inspire other black female athletes to pursue triathlon, and have zero doubt she will reach her goal. On the other hand, Diana was asked challenging questions about the current state of Ironman, ranging from the inclusion of two races at the Half Ironman World Championship race, one day for women and one day for men, and then about why there is still only one day for us ALL at the full Ironman World Championship race in Kona, HI. Her answers appeased some of the crowd, but not all, proving the spirit of the Summit to be true; there is still a long road ahead of us to insuring women have a fair presence in triathlon. That sentence is meant to be vague. We all need to continue asking questions to the people in positions of power, because according to Ironman, Anything Is Possible. From left, Hillary Biscay, Kay Martin, Angella Goran, and Kelly O’Mara. The afternoon brought about a change in format as we split up into two breakout sessions. I attended the one for the Entrepreneurship and Innovation for two reasons, the first being that Hillary was on the panel, and Kelly was moderating it, supporting my tribe is always my top priority, but I also took my seat in the audience as a budding business woman. That’s right, my coaching business has now crossed over from running to triathlon, and I am LOVING every minute of it! I believe my experience as a parent and producer makes coaching a natural fit, plus I accrued some real experience over the years that I look forward to sharing with my athletes in order to help them achieve their goals. I also have some other ideas of how I can lend my skills as a writer to small and large companies on social media, so attending this breakout session hit the mark. Plus, I always enjoy hearing the story of how Hillary and Michele started Smashfest Queen. Smashfest Queen has a similar history like Hed Wheels, in that Hillary sold her super slick racing triathlon bike in Brazil after competing in the Ironman in 2012, in order to fund the early days of Smashfest Queen. That is incredible. We also heard the stories of two other entrepreneurs, Kay Martin from BOCO gear, a veteran in the field of athletic apparel, and Angella Goran, an innovator in the virtual insurance space for athletes. I was impressed by all three of the ladies, but since Angella had the most experience raising outside investor capital, AKA she had extensive experience giving pitches herself, that I figured she would be a great audience to pitch my marketing idea for social media. Thankfully, I grabbed an opportunity to give her my pitch before she flew out later that night. That experience alone was vital, (the first of many pitches for that idea), but the fact that she gave me helpful and positive feedback was icing on the cake. Once again, the message of the Outspoken Summit rang true, women helping women to grow and succeed. After the breakout panel wrapped, an athlete named Alysha approached me to talk about my pursuit of earning my pro card next season. She was in the audience as well, and even though I announced that goal in my blog last week, (thank you everyone who read that and sent your support), I think she learned about it because Hillary announced it to the room as she was describing the spectrum of athletes she holds dear on Smashfest Queen’s all women triathlon team, TeamSFQ, “and Taryn, who is aiming to go pro.” Hillary holds a lot of respect in the triathlon community, when she talks people listen, so even though I would like to believe everyone in that room read my blog last week, the fact is my pursuit of going pro was magnified about one million percent by Hillary saying it out loud. In that instant I was flooded with both daunting and exhilarating emotions. Let’s GO! However, once I started talking to Alysha, an athlete who had already earned her pro card this year, but hasn’t taken it yet, the purpose behind my goal thundered through every word I spoke, I want to encourage other athletes who are either there, or on the verge of going pro, to be brave enough to step up and take their spot. It is actions like that which will bolster the women’s numbers in the pro field, and whose stories could reach a wider scope of women in the amateur ranks who feel inspired to pursue their own potential as well. In essence, more women taking their shot at racing pro, creates a cycle of strong female role models for younger women to look up to, want to become themselves, and inspires the next generation when it is their turn at the top. I know where I am in my triathlon journey, closer to the top of the mountain than the bottom, so when I spoke with women eight to ten years my junior, like Alysha, eager to find their footing, I felt compelled to give them insight into the many positive years they had in front of them as long as they were willing to put in the work every single day. I believe triathlon rewards grit over talent, so when I meet someone who possesses both attributes, I go to work on encouraging them to pursue their potential; an act that will only help the sport I love flourish long after I am on the other side of the mountain. My fantastic TeamSFQ teammates who attended the Outspoken Summit. From left, yours truly, Maxine Louise, Kelly O’Mara, Audra Miller, Hillary Biscay, Haley Chura, and Taryn Fimiani Pro Triathlete Nicole Valentine is not pictured. Photo courtesy of Hillary Biscay. As the day turned into night, my excitement for the marquee event started bubbling over. I was excited when registering for the Summit, but when I was filling out the form online and saw a box to participate in the Poetry Slam held on Saturday night, I nearly jumped out of my seat. If you know me at all, you know that my favorite place on the planet is standing in front of an audience and speaking into a microphone. I love public speaking. I am continually trying to find avenues to do it, which is a challenge, but I will share my story to any audience any time, so please let me know if there are opportunities in your area that I can explore. I will travel. Furthermore, it should not come as a shock that I checked “yes” on the Poetry Slam box on the registration form, wrote a poem last Monday, had it memorized it by Wednesday, and performed it, (along with a few other gamely participants), in front of an enthusiastic crowd on the rooftop on Saturday night. Bringin’ the rhymes and good times. Another fun and gut checking moment from the weekend was the run workout I completed on Sunday morning. Last week Kelly proposed on my Facebook wall that we run together on Sunday. That request may seem light-hearted and fun, however not only is Kelly is professional triathlete, which I mentioned earlier, but she is also a super quick runner. She won the Silicon Valley Turkey Trot 10K in a blazing time 37:18 minutes. That’s fast. Nevertheless, I replied that I was up for it, as long as Hillary gave me the thumbs up. Hillary coaches both of us, so even though I had concerns that my fitness may not be up to snuff because I had barely run since the New York City marathon four weeks prior, and I didn’t want to hinder Kelly’s workout, (she is still in season as she will be lining up at Challenge Daytona this weekend), when Hillary gave me the green light, I was pumped! I don’t have any photos of our run, but it was fast, tough, and fun. Unsurprisingly, I could not hang with Kelly the entire workout, but I was thrilled to have the opportunity to tag along and I did feel pretty good considering the state of my run fitness. Also, the rare and precious opportunity to run with a friend and teammate is one I will never pass up. I felt like Gwen to her Shalane, both in our differences in stature, and in the fact that Gwen always seems happy to just be running in the same zip code as Shalane in her training videos. That was me on Sunday, thrilled by both the invitation to run the same workout as Kelly, and given the high sign to run fast by Hillary. The schedule for Sunday started us off attending back to back breakout sessions. The first one I chose was titled, The Rising Tide of Women’s Leadership, lead by Rachel Joyce and Dana Platin from Reinas. I have always gravitated toward leadership roles. I held roles in student government in Junior High school and High School, as team Captain on various sports teams, volunteered as the Team Parent on every soccer and volleyball team Hannah ever played on, lead visual effects crews as a producer, and now as a coach of runners and triathletes. Therefore, the information and skills that Rachel and Dana introduced, finding our “Why” and valuing communication, were meaningful lessons that I will take with me as I continue to cultivate my story by leading others to be their best, by doing everything I can to be my best. Screen right, Marilyn Chychota. I wish in had a better photo, but I was in the back. The next breakout session I attended, How To Succeed As A Coach, Competitor, and Leader was filled with priceless information shared by one of my long-time heroes in triathlon, Marilyn Chychota. Marilyn was a professional triathlete, and member of TeamTBB, Brett Sutton’s training group, alongside Hillary, back when I was a newbie in triathlon, and started geeking out on all of the pro’s. I have followed her career all these years, and admired how she not only amassed many accolades in triathlon, but also in cycling, and power lifting. Yep, power lifting. Did I mention that she started her career in sport as a show jumper? Talk about a wide spectrum of interests. I appreciate Marilyn’s coaching methodology most of all, and hung on every word and insight she shared during her session since I am starting down that path now, and aim to become a better athlete and coach every step of the way. Next up was a nutritious lunch for both our body and minds, as we were lead through a powerful presentation by the renowned author of the book, Roar, Dr. Stacy Sims. I had heard Stacy speak as a guest on the IronWomen podcast earlier this year, so I was familiar with her research, but to hear a much more in depth account of female hormones and how they affect performance, definitely stirred up some questions I plan to ask my OBGYN at my next appointment. I have not read Roar, but I am planning on it, and I suggest you all read it, too. From left, Dr. Stacy Sims, Marilyn Chychota, Meredith Kessler, and moderator Tenille Hoogland. After Stacy’s talk, she was joined by Marilyn and Meredith on a panel for the entire group called, You Are Not A Small Man, Stop Eating and Training Like One. The title is in reference to how most fitness research is performed on men, not women, even though men and women’s bodies react completely differently from each other in nearly every circumstance, but especially those involving fitness. Obviously, that void in research needs to be filled. In the meantime, it was helpful to have the three strong, (look at their arms), women on the panel share the knowledge they have gained from years in triathlon from the point of view of Science, and as athletes and coaches. From left, Gabriela Gallegos, Jamila Gale-Agans, Kelly O’Mara, and moderator, Victoria Brumfield. Once we finished lunch, we strolled back to the AC Hotel for our final panel, The Future of Triathlon, which featured Jamila Gale-Agans, an Ironman and half-Ironman finisher who is also a coach and active duty officer in the Army, Gabriela Gallegos, an athlete and race director from El Paso, TX, and Kelly O’Mara, a pro triathlete and journalist, just a few among her other many job titles I mentioned earlier. The discussion was lively and honest from the start, as one of the audience members asked Jamila, who is black, what she felt white women could do to help encourage more women of color become triathletes? I think it is a safe assumption that a question like that could easily go sideways, but that is what made his group of women so special, we were willing to ask and answer tough questions in the pursuit of progress, and I believe Jamila’s answer hit it out the park. She said she was introduced to triathlon by her white friend, so she encouraged us to ask black women, Latina women, etc., that we see at our gyms to join in on the triathlon fun. The key lesson being inclusivity is the special sauce for growth. The final session of the Outspoken Summit had us breaking off into small groups to brainstorm ideas we could start right away once we returned to our communities. The ideas were vast, yet tangible. For example, start a triathlon group, send thank you cards to race directors, go speak to students at local schools, elementary up through high school, encourage friends before, during, and after workouts, write a book, start a podcast, write a blog, etc. the list goes on. My goal is to continue sharing my story through writing and videos, and to encourage ALL of you to share your stories, too. Once that final session wrapped, we took a large group photo, slung around the lobby chatting and saying our salutations before some women drove off to the airport and others walked toward town to enjoy a final festive meal together. I had planned to fly home Monday, because I did not want to rush through this part of the weekend. I wanted to linger and let it all sink in. I am grateful to have been a part of such a groundbreaking weekend. I made new friends, forged connections for future business ventures, introduced myself to many of my role models, shared more of my personality, and rejoiced in the greatest gift I have ever received, being an Outspoken Woman in Triathlon.